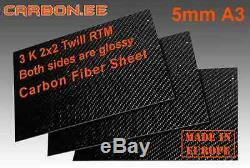 This is a 5mm carbon fiber A3 size sheet that is made in Europe, in Estonia. 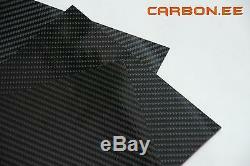 Pure 100% carbon fibre sheet. 30 x 42cm; 11,7" x 16,5"; A3. 80 °C; 353.15 °K. High quality epoxy (Same product used in automotive industry). Usually our clients use our sheets for. Drone, UAV, helicopters, frame details. Panels for switches in cars, boats. About 5 - 15 days to. East Europa, West Europa, Mid-East. About 10 - 20 days to. About 15 - 30 days to. We have a good experiences with our transport partner, Omniva Estonian national logistics company. Sheet edges are cut by saw machine and sometimes may have some tolerances. Both sides are glossy finish. 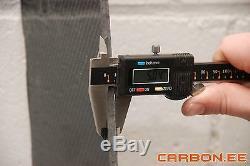 We send invoice with the Carbon Fiber sheet in the package. Our main bank is Sweden bank SwedBank AB. 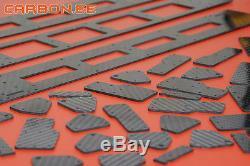 Our carbon fiber plate maximum size is: 450X450mm. There is also special thickness available: 0,5mm; 1,5mm; 2,5mm; 3,5mm.. We also make A3 size sheets, but right now is available for sell only 1mm thickness. We are going to make bigger thickness in the future for A3 size. 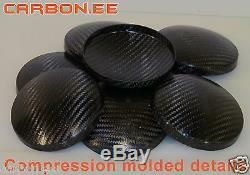 We also offer carbon fiber cutting services with CNC milling machine. For custom details please send Your drawings in DXF file. Minimal holes and slots should be greater than 2mm. Our Internet shop is right now in processing. 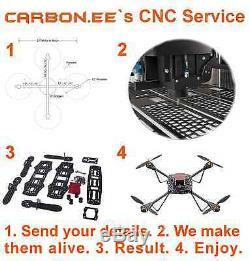 Our aim is to offer our best products and service. We will solve Your problems, do not leave low or bad feedback or open case firstly. Your satisfaction is our priority and Your support and trust is extremely important to us. Thank You for Your understanding and patience. Was created 2010 in Estonia. 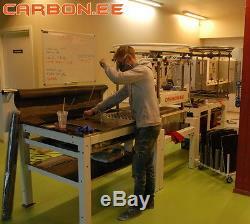 Ee`s main occupation is Carbon Fiber products. Our registry number is: 11951193. 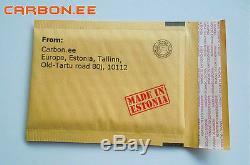 Address: Europe, Estonia, Tallinn, Old-Tartu road 80j, 10112. 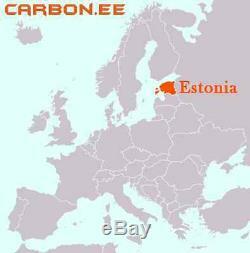 Estonia is known as high technology country what is located in Northern Europe. Renard Carbon Fiber Motorcycles are created and produced in Estonia. Skype and Transferwise was created by Estonians. Worlds famous businessman Richard Branson Invested in Transferwise in 2014. See what Richard Branson thiks about Estonia. Provide reliability, hing-quality products and good service. Grow reputation in global market with internet services. C ustomers- We understand that every costumer is special. A ctive- We are open minded and we develop our business constantly. R ectitude- We take responsibility about our products what we sell. B rand- We value our brand highly. O ptimal- We offer to our costumers optimum solutions. N etworks- We choose carefully our business suppliers and partners. 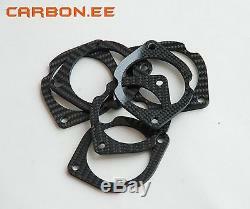 The item "100% 3K Carbon Fiber Twill Wave Sheet 5mm A3 For Carbon Fiber Quadcopter Frame" is in sale since Monday, June 27, 2016. This item is in the category "Sporting Goods\Cycling\Bicycles". ee" and is located in Tallinn, Harjumaa. This item can be shipped worldwide.